You can connect your Google Calendar with MeetingKing for automatic two way syncing. When connected, all your events in Google Calendar will show up in your MeetingKing calendar and clicking any of those events will automatically create an agenda and notes page for that event. MeetingKing will copy the title, list of participants, date, time and location. All you have to do is prepare your agenda (make sure you use templates) and write your notes! The integration also works the other direction. 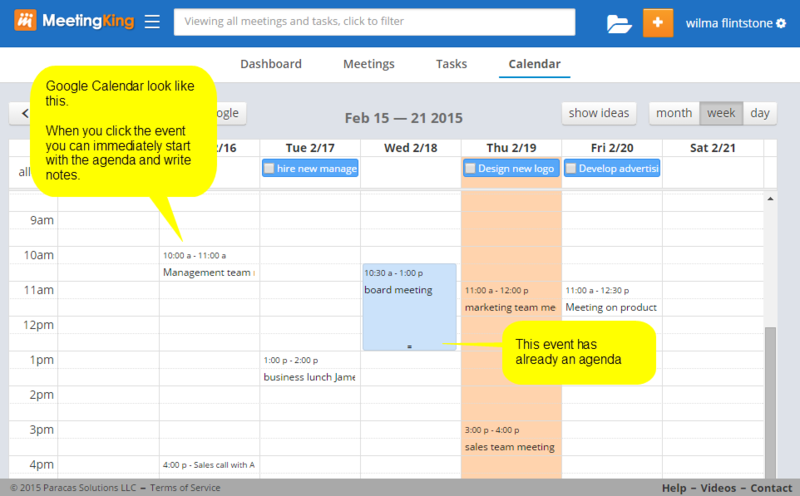 Any meeting in MeetingKing will automatically be added to your Google Calendar. The Google Calendar integration is a Pro feature.